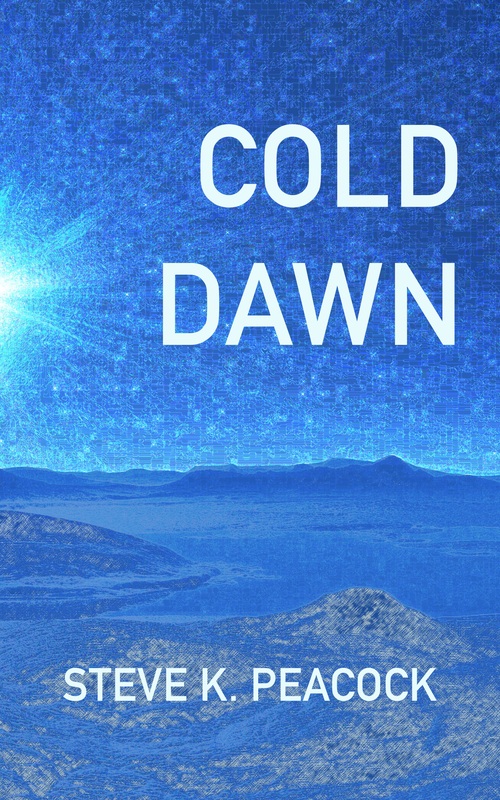 It’s been ten long years of blistering darkness, but finally the sun is rising, and Wendy Milton is there to see it. Stamping communications beacons into the ice is important work – valuable work – but nothing could possibly beat the sight of a virgin sun. But when she and her crew discover a wreck beneath the ice – some great mechanical behemoth from before the planet became frozen – it isn’t long before she’s unwillingly dragged into the true reality of living on an ice planet. It’s not just the environment that’s cold, it’s the people too. Between bidding wars and ice pirates, people seem to want this wreck pretty badly. All Wendy wants it to cut a profit, but at what cost? The first dawn in a decade, and she had the perfect view. Nestled at the top of the mast, she had been watching the thick, insistent darkness start to grudgingly relent, turning a deep purple and now into a pleasant navy blue. It wouldn’t be long now, another few minutes and she’d see colour again. Not much, admittedly, but when you live on an ice planet you can’t really be picky, can you? Ice is ice is ice, but a bit of blue and yellow in the sky would go a long way towards making a difference. She felt the ropes shift underneath her and looked down into the face of Thorsten Wolfe, the ship’s navigator. He was wearing two pairs of goggles, one over his eyes and the other holding back his hair like a headband. She blew the air out of her nose as a gesture of something, she didn’t know what, and put the goggles on. Even in the dark, they had told her, it was still possible to get snow-blind. The ships all had huge lights attached, and the ice was treacherous enough to bounce them right back into your face if you weren’t careful, but she had hoped that she could see the sun crest those mountains just once with the naked eye. She felt Thorsten settle in beside her, silent and reverent. For all his bluster, he was as excited as she was. The rest of the crew were older and this wasn’t a true event to them, though the sound from the razors that carried the ship across the ice seemed somewhat muted. Maybe it was the altitude – she rarely had cause to climb up this high while the ship was in motion – or perhaps the old sods had a sense of occasion after all. The navy blue was starting to bleed away now, a small arc of a lighter hue was expanding quite rapidly, pushing it away. The goggles dimmed it a little, but she was surprised at how much they still let through, especially once the redness started to bloom through the blue. Thorsten put his arm around her, softly but insistently pulling her close for a hug. She let him, folding herself up against his chest and using it to block out what little noise of the razors made it up to her. As the barest sliver of the sun crept over the mountain of ice in front of them, she couldn’t help but smile. It seemed so foolish to be excited about something that seemed so effortless, and yet she didn’t care. Ten years of light, ten years of darkness, that was the way of things. Why not make an event of it? The pair of them sat in silence until the sun pulled itself free of the distant peak, and then in unison they flinched as their radios squawked. ‘Right, youth, you’ve had your little dream date. Back to work,’ a guttural voice growled over the feedback. They climbed down quickly and were met on the deck by a tall man in a heavy coat and heavier boots. Once Wendy would have described him as having a shock of black hair, but as it had started to grey it had graduated to a fright, giving him the appearance of being the only man that would delight in finally going bald one day. He nodded towards the back of the deck, to a door haphazardly clanking against the jamb in time with the bob of the ship. As if she needed directions to her own workshop. In truth, it was Lucille’s workshop. She was the ranking engineer, but not through choice. The poor woman had been subject to a battlefield promotion, or so Wendy had been told at length, after her predecessor had thrown himself into the razors one night and Lucille had been the only one willing to unjam them. At the moment Wendy entered, Lucille was angrily hammering on a rack of beacons. ‘It’s my job,’ she said, tapping her temple in an odd sort of salute. To be fair to Lucille, the beacons were top-tier technology. From her understanding, it had taken fifty years to build the very first one, and another ten to work out a way of replicating the things in the numbers they needed. Sure, at their core they were just a sort of spruced-up Wi-Fi relay, but they had to survive in the ice for a long time without maintenance. It wasn’t really a surprise that the user experience hadn’t been foremost in the mind of the designers. Wendy gave the racks a once over while Lucille watched, just to be safe. Everything appeared to be in order. She turned to her left, towards the large wrought iron contraption that had been bolted into the only patch of floor into which it would fit. ‘Did you get around to calibrating this, Lu?’ she said. Easy. The hardest part of the whole procedure was calibrating the thumper – the machine that would fire the beacons into the ground and, hopefully, several feet below the surface – so that the device would get maximum protection and signal strength. Pretty much everything else, except turning the beacons on in the first place, was fool proof. She had it down to a fine art. The thumper looked complicated, though in a much more rugged and old-fashioned way to its sleek ammunition. It was a big, chunky, imposing device that made you work for its co-operation: twisting knobs and pulling levers and spooling things. The very first calibration could take up to twenty minutes while you unlearned that most consumer of fears, the belief that treating it too harshly might break it. But the thumper was a work horse. A big, industrial goliath. If anything was going to break from your harsh treatment of the thing, it was going to make sure it was you. As a result, Wendy could have it calibrated in about thirty seconds if she rushed, or two minutes at normal pace. A few moments after the last ratchet clicked into place, the razors whirred to a halt. The sound rang through the air for a second or two afterwards, tainting the silence that replaced it. As a general hum, the razors sounded fine, but the shut down and start up gave them a macabre edge. The woman nodded and gripped the beacon, sliding it free of its rack. Thick, ropey muscles bulged under the surface of her exposed arms as she tried to find her balance, though there was little exertion on her face. Once her balance was secure, she deftly moved the device around and loaded it into the thumper like a chrome torpedo. ‘They’re awkward buggers to shift, Wendy,’ she said. She risked a glance at Lucille. The woman hid her sheepishness well, but her hands had found the wrench again and her knuckles were white from the grip. A green light blinked into life behind a pile of spare parts somewhere on the far side of the room. Wendy punched the button as hard as she could. The beauty of the thumper was that it was more mechanic that electronic, but it also meant that the various moving parts needed a bit of force to get going. There are some noises the human brain can adapt to from prolonged exposure, but not this. The sound of the beacon being driven into the ice by the enormous piston was so severe that it triggered the survival instinct. That wasn’t a machine, your brain would say, it was some ancient and ferocious beast. Although, on the plus side, it was so loud that it invariably drowned out Wendy’s startled yelp. That was something. Ordinarily, that was the end of it. A loud bang, a small whooshing sound, and then a few moments of her eardrums knitting back together after such a terrible kicking. That there was a second loud bang was unusual. That it heralded a ground quake was even more so. There wasn’t time to speak, only to grab onto something. Wendy wrapped her arms around the chunkiest parts of the thumper, and saw Lucille almost tie herself into the beacon racks as the ship bucked violently for a moment. Tools rattled against their hooks on the walls, a few breaking free but, largely, the ship knew what to do. It was built well all those years ago, and reasonably well kept. They just needed to ride it out. A second, smaller quake dragged the ship in another direction, catching both the women unprepared. Wendy first, they slammed into the outer wall, grabbing for anything that could save them from a return trip any second. There was chatter on the radio, but Wendy couldn’t make it out. Except for the swearing. That was universal, and no amount of feedback or static was going to conceal that. It died away as the quakes did, and once the ship settled the radio grew silent too. Wendy and Lucille pulled themselves to their feet slowly, making sure they hadn’t broken something important. They looked up as the captain cautiously stepped through the door. Lucille punched him before he could finish the sentence, a jaw-cracking uppercut that drove his teeth into his tongue. He staggered for a moment before righting himself, his eyes burning and twitching with wrath. ‘There is no way you could have ended that sentence which wouldn’t warrant that smack, Josh,’ she said, casually slipping into something Wendy would have dubbed a boxer’s stance. The captain pursed his lips, moving his tongue around behind them. Then, with a very noticeable force of will, he pried his frown apart and the rage left his gaze. Lucille dropped out of her stance and turned her back on him, taking up a position over by the thumper. He waited until she wasn’t looking before he started massaging his jaw. ‘I think we should revisit the alien hypothesis,’ came Thorsten’s voice. He stopped mid-sentence, interrupting himself and going completely silent. Then his hand snaked through the door and made a gesture for Wendy and Lucille to follow him. As she stepped out into the sunlight, the first thing Wendy saw was the damage to the ship. It wasn’t as bad as it should have been, she thought, though the fact that one of the razors had punched its way halfway through the deck was somewhat sobering. The masts were cracked, one seemingly held in place entirely by the rigging alone, but for the most part the damage was superficial or to minor bits of equipment. It took her a moment to look beyond the ship. There was something hanging in the air, like a fine mist or fog, shimmering away just off the port side. It made the sunlight dance, but aside from looking utterly enchanting it didn’t seem to be really doing anything. Thorsten, Lucille and the captain were staring at it in wonder, however. She joined them at the side of the deck, following the mist down to the ice below. The ice was further up the hull than it should have been by a large margin, the ship had clearly dropped into a ditch of some kind when the beacon had shattered the surface layer, but the cracks didn’t extend far from where they were currently lodged. It looked more like the ground had swallowed them than been blasted loose by the spiking. Something was twinkling down there, though. Was it glass? An emitter, maybe? That might explain the beautiful dancing fog. She would have to go down there and take a look. Flicking the switch on her belt, she hooked her harness to the nearby balustrade and gingerly lowered herself over the side of the ship. ‘Oh no you bloody won’t,’ Lucille said. She nodded and started to descend in earnest, as if she knew what she was doing. It wasn’t much of a lie, saying that she had to determine how badly entrenched they were. She did need to do that, but that could probably have been done from the ship itself. They had sensors and machines that went ping, lots of useful gizmos for keeping track of the ship and its surroundings. That was kind of the point. But she was curious, like a good little scientist should be. And why not? This situation was perfect for curiosity. It was the sort of thing curiosity was made for. The mist made the climb down a bit more treacherous than she had expected. All of her climbing training had been done in the dark, so doing it in daylight should have made it considerably easier, but the way the mist was disrupting the light that passed through was confusing her. At least it wasn’t much of a climb. Having to deal with things like hand holds with this weird lighting would have been awkward. When she reached the ice, the effect of the mist was greatly reduced. Looking up, what she could see of the sky was covered with it now, a beautiful painting in the air itself. The tail of light was much more visible from underneath too, a faint cone emanating from that glass lens she had seen from above. So, definitely a projection then. Carefully, she crossed the ice to the lens. The ice creaked under her weight, but it seemed sturdy enough, which made sense once she reached the projector. Most of it was buried, but there were signs that it was considerably larger than the lens itself, with a pitted metal housing vanishing below the ice. Dropping to her knees, she swept away what loose ice there was, uncovering more of the metal and a few more broken lenses. Not just a projector, but an entire array. Fascinating. ‘If you wouldn’t mind, it would be a big help,’ Wendy said, stifling a giggle. She had missed the impact zone on the way down because the projection had been the focus of her interest. It wasn’t really wreckage at this point, the pressure of the thumper didn’t allow for that. It either pierced the entire planet or it reduced the payload to sparkly dust. It had done the latter here. It was a moderately frightening display of force for a machine. Wendy wanted to join in. Thorsten might have been playing the mercenary card to get the captain on board – and he wasn’t wrong either, old tech was worth a hell of a lot of money – but she knew that tone. He was just as intrigued by it as she was. He had to know. If she had ridden to his aid in that argument, however, the captain would have dug in his heels and that would be that. She had seen him do it before, though never over something as potentially momentous as this. The waiting was torturous, however. ‘I promise,’ Wendy shot back a little too quickly. She didn’t hear Thorsten’s reply, but she inferred his agreement from the sight of him climbing over the railing above her. He practically abseiled down to her, his feet barely touching the hull. ‘Yay!’ Wendy replied, high-fiving him. Without tools, there was only so much ice they could shift. The going was easiest near the already exposed lens, but even after an hour’s work they only managed to liberate a small area. More lenses, all equidistant from each other, more blank metal, rivets, nothing particularly exciting. ‘What do you suppose it is?’ Thorsten asked. And, to his credit, he tried. He targeted one of the seams where the rivets looked a little more corroded than the rest, driving his boot down hard. The spikes in the soles left small scratches, and he managed to dent the steel a little, but there wasn’t much in the way of give. The noise continued to roll around inside, however, building like a maelstrom of sound into some great crescendo. When he finally stopped the echo remained for a good ten seconds. Like the ticking of some vast clock, it drummed through the steel in perfect intervals, kicking a few of the other lenses to life. There was a whirring as they aligned with the one that had already been active, enhancing whatever it was projecting.